Best of Nepal Tour starts with a guided sightseeing tour to UNESCO listed World Heritages Sightseeing at Boudhanath- World's biggest Stupa, one of the holiest Buddhist pilgrimage where all devout Buddhists come for a pilgrimage, Kathmandu Durbar Square- the medieval Kings palace who ruled the then Kathmandu Kingdom.Visit Hanuman Dhoka Palace, temples, Kumari Ghar which is dedicated to living goddess Kumari, Swayambhunath- the Monkey Temple from where you can see the magnificent views of Kathmandu Valley and tribute to Buddhism and Patan- Patan is also known as The City of Fine Arts to experience Nepal's cultural, natural and biological richness and diversity. The best of Nepal tour provides you the best opportunity to explore the some of the world-famous cultural heritages, natural resources, prehistoric places, with unique lifestyle of Nepalese people. After the tour in Kathmandu we drive to Pokhara – country's most beautiful city blessed with natural beauty and also known as the city of lakes. In Pokhara, you will enjoy visiting to Davis Fall. Guptswor Gave and International Mountain Museum, boating in Phewa Lake and hike to Peace Stupa if time allows. You also will witness Giant Annapurna Himalayan Range from Pokhara including Machhapuchhre, Dhaulagiri, Annapurna South and Gangapurna. And Riding an elephant back safari, canoe ride, bird watching, elephant breeding center, jungle walk, fascinating Tharu cultural show, village tour with 2 Nights 3 Days activities in Chitwan National Park will make your tour more memorable. Day 01 :Kathmandu - 1300m altitude Arrival at Tribhuvan International Airport at Kathmandu and transfer to the hotel by our representatives. It will take around 20 minutes drive to Hotel. Welcome drinks on arrival and briefing of tour program by one of our representative from the company. Day 03 :Kathmandu – Pokhara - 900m altitude (B) After Breakfast, drive to Pokhara. It is 5hrs drive and 200 km distance from Kathmandu to Pokhara. Pokhara also called the city of Lakes. The city offers you to view the magnificent view of the Dhaulagiri, Machhapuchhre, Manaslu and five peaks of Annapurna and others. Check in hotel and rest for sometimes after hot shower. Strolling around lake side, hire a boat and visit Barahi Temple - unique temple situated in the middle of Phewa Lake in the evening. Day 04 :Pokhara Sightseeing (B) Early in the morning drive to Sarankot hill to have the sunrise views over the Himalayas. It will take around 20 minutes drive and 20 minutes hike up from your hotel. After enjoying the beauty of nature, return to hotel for breakfast. Then start half day sightseeing at International Mountain Museum- provides information on mountaineering, the world's mountain system, mountain cultures, environments, prominent people in mountain history, mountain geography, ecology, exhibition of mountaineering history and implied methods,, Gupteshower Cave- popular for the different natural forms made from limestone deposits and Devi’s Fall -It is the most famous water fall in Pokhara, which comes to its gushing best just before disappearing underground. Evening enjoy walking along the bank of Phewa Lake, admiring the stunning reflection of the Fish Tail Peak in the blue Phewa Lake waters. Day 05 :Pokhara- Chitwan (B,L,D) After breakfast, drive to Chitwan for 4 and half hours – 150 km. You will see very nice sceneries, rivers, farm land, paddy field, typical houses and life style of the people on the way to Chitwan while you drive. All the way you will descend down along the winding road on the banks of the Trishuli River. After checking in to the hotel and getting refreshed you will be briefed about full nature programs by our naturalist guide. Then we head on for activities. There will be a guided village walk and a walk on the banks of the Rapti River to watch the charming sunset views in the sub-tropical jungle. In the evening, dinner with cultural program by ethnic tribal people with their stick dance and tribal drums. Overnight at Chitwan. Day 06 :Chitwan (B, L, D) Wakeup call with cup of hot tea/coffee. After breakfast on your choice go for Canoe ride along the Rapti River. An excellent opportunity for bird watching and for seeing the 2 rare species of crocodiles; the Marsh Mugger and the only fish eating Gharial then you will be taken to real nature walk with different type’s vegetation to see many different types of floras and faunas. Before lunch you can take a leisurely relax little while. After lunch go for elephant safari, an excellent opportunity to see four different kinds of deer, rhinoceros, monkeys, leopard, sloth bear, and the Royal Bengal Tiger. You will also encounter many other smaller mammals that have made Chitwan their home. Overnight at Chitwan. Day 07 :Chitwan – Kathmandu - Nagarkot (B) Wakeup call with cup of hot tea/coffee.Visit to the elephant breading center to see baby elephants with bird watching in river bank. After breakfast drive back to Kathmandu. Further, drive to Nagarkot that takes around 40 minutes. Nagarkot is very famous place for the overnight stay and to see the long chain of mountains from your hotel’s room.Check into the hotel. Rest of time is yours. You can do short hiking to the Nagarkot and enjoy sunset view in the evening over the major peaks of eastern Nepal Himalayas including Mt Everest. Day 08 :Nagarkot- Kathmandu (B) Early in the morning enjoy sunrise view and long chain of mountains from your hotel. After breakfast drive back to Kathmandu. En route visit Bhaktapur Durbar Square- World Heritage Site. 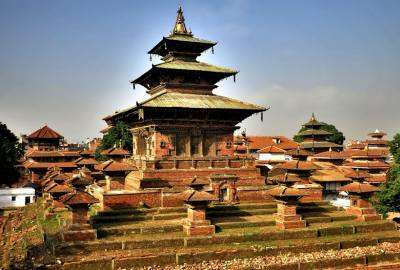 The medieval town of Bhaktapur, or the Town of the Devotees, preserves medieval arts, architecture, culture, and lifestyle to this date. One is sure to feel like travelling back into the past while walking along the Bhaktapur thoroughfares, squares and streets. Check in hotel. You will offer for the refreshment and rest in the hotel. Rest of the time is free on your own. Day 09 :Departure (B) After breakfast, drive to airport and departure to your country. All airport shuttles by car or van depending on group size. 3 Nights deluxe room in 3 star category hotels in Kathmandu with breakfast basis. 2 Nights deluxe room in Pokhara in one of best tourism standard hotel. 2 Nights 3 Days Chitwan National Park Safari with full board meals. 1 Night deluxe room in Nagarkot in 2 star category hotel. Pokhara city tour with private car/van and tour guide. All local tax, vat and service charge. Admission fees in World Heriate Sites.